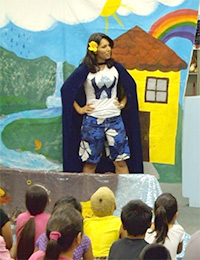 WaterWoman was originally played and created by Tulsi Gabbard, HHC's Co-Founder and Vice President. Tulsi was elected to the Hawaii State House of Representatives in 2002, at 21 years old, becoming the youngest legislator ever elected in Hawaiʻi. She enlisted in the Hawaiʻi Army National Guard in 2003, and shipped off to boot camp shortly after the legislative session was complete As she campaigned for re-election in 2004, the 29th Brigade Combat Team was activated for a combat tour in Iraq. Even though not personally called up for duty, Tulsi knew that she could not stay behind. She volunteered to deploy with the 29th BCT and withdrew from her re-election campaign. In 2007 she completed 60 days of rigorous training at the Alabama Military Academy's Officer Candidate School. The training was physically and mentally tough, with virtually no contact with the outside world. Out of 155 graduates from 42 states, Tulsi received awards as the Distinguished Honor Graduate, due to her being at the overall top of her class in leadership evaluations, academics, physical fitness, and peer evaluations. Tulsi made history by becoming the first female Distinguished Honor Graduate in the Alabama Military Academy's 50 year history. 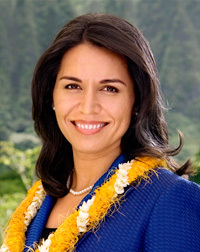 After a second deployment to the Middle East, Tulsi served on the Honolulu City Council from 2010 to 2012. Tulsi is currently the Congresswoman for Hawaiʻi’s 2nd District and continues to work toward protecting and conserving Hawaiʻi’s precious environment.